Featured in InStyle, Martha Stewart, The Knot & More! Brought back from our archives, the ever popular Sharon monogram! 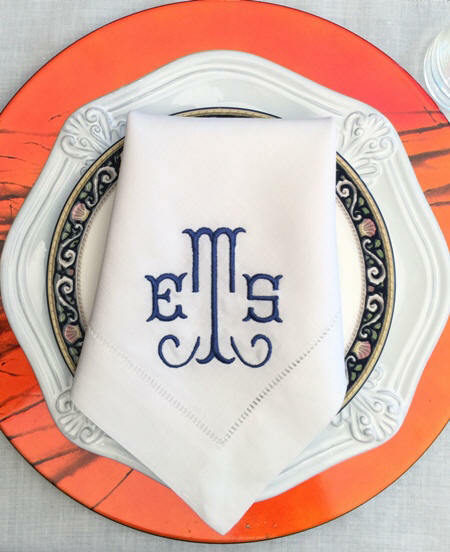 Traditional three letter monogram beautifully embroidered in one color, or for fun, try two colors! Gift boxed with ribbon. Prices below include the monogram! Color: White,- 22" x 22"
Approximate Monogram Size Guideline: Please contact us if you prefer particular size or placement. Luxury linens and bedding linens are much more than a famous name or 'too much talk' about thread count. Luxury linens are first and foremost about discovering and enhancing your own individual style to create a decor that makes you feel at home. Select from a vast array of fabulous styles that are sure to suit your desires and requirements. View our exquisitely detailed embroidered bedding collections, luxury linens with fine delicate embroidery or standout monogramming (or both!) , fashion luxury bedding ensembles showcasing today's color and design themes, easy care matelasse coverlets, and quilts that have come a long way. Luxury fabrics woven from fine Egyptian and other fine cottons, silks and linen make our collections real and unique. Excellent craftsmanship, dressmaker details, and quality fabrications create great design and style.....a style we are sure you will find here at Bella Lino Luxury Linens! And as always, if you have any questions, or prefer to place your order over the phone, please call for personal attention.